I was contacted by a very nice man from Winooski, Vermont who had found a photo at an antique store with some writing on the back. It just said “LaVigne Family, related to Cordelia Olivier”. He Googled that name and came across my blog. I’m actually related to two different Cordélie Olivier’s. One is my great-great-grandmother. The other is my great-great-grandmother’s niece… the daughter of her brother Henri Octave Olivier. This second Cordelia (b 1867) is the one the photo means, as it turns out. She was my 1st cousin 3x removed, which means that her grandfather, Henri François Olivier was my 3x great-grandfather. I did some looking in my family tree and found out that Cordelia’s niece Luciena “Lucy” Olivier had married Napolean Joseph LaVigne in Burlington in 1916. So that was the connection between the two families. The photo shows a middle-aged couple with five children around them. Almost immediately I suspected it was a wedding photo since the man and woman in the center are dressed like they are a bride and groom. Also, the bride has her hand on the shoulder of the woman. So if it’s a bride and groom, it’s likely her family and not his. It looks like the photo was taken around the turn of the century. I would have guessed between 1895 and 1905. It was taken in Winooski, Vermont. And it looks like the “mother” in the photo is older than the “father”. After doing as much research on the LaVigne family as I could, I had all the ages of all the members of the extended family. It was easy to rule out this being Lucy and Napolean. It was taken too long ago to be them posing with their family. None of the ages worked out for it to have been taken at their marriage either. In 1916 no female member of the family was as young as the youngest girl in the photo. In fact, the main issue was that nobody in the LaVigne family was even IN Vermont until 1911. Plus the LaVigne family that married the Olivier family was huge. There were 14 kids in Napolean LaVigne’s family. So I started looking around for other families that were related that might fit. After many permutations, I finally found the right answer, and was able to verify this subsequently using other photos. It is not a portrait of the LaVigne family at all. Marriage of Félix Baillargeon and Eugenie Olivier, 29 Aug 1904, Burlington, VT. The photo was taken at the wedding of Eugenie “Jennie” Olivier (1886-1965) to her husband Félix Joseph Baillargeon (1884-1958). 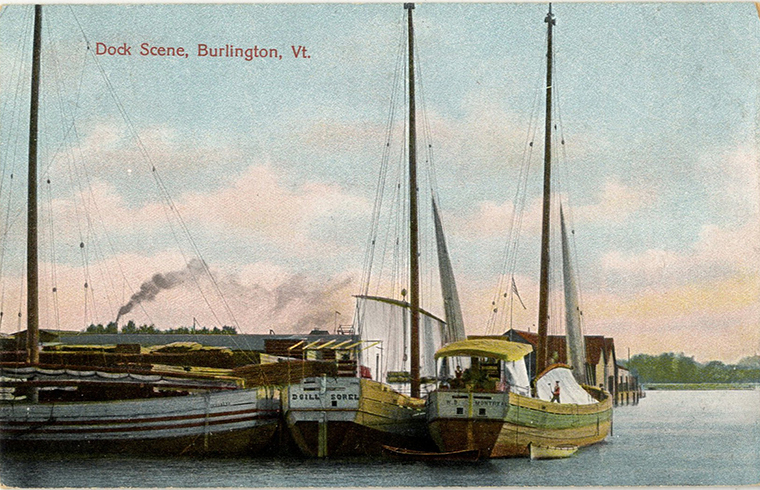 The marriage was on 29 Aug 1904 in Burlington, Vermont. Some members of the family used “Badger” instead of Baillargeon, so many documents list them as Felix and Jennie Badger. Arthur Joseph Olivier (1890-1954), Jennie Olivier (1886-1965), Lucie Brasseur Olivier (1860-1928), Félix Joseph Baillargeon (1884-1958), Joseph Hildaige “Hildaige” Olivier (1865-1952), Aldea Georgianna “Leah” Olivier (1888-1975) and Luciena “Lucy” Olivier (1896-1984). Lucy, of course, would eventually become Lucy LaVigne. I am guessing someone who was related to Lucy Olivier LaVigne knew this was in her collection, but didn’t know which side of the family it was from and assumed it was LaVigne. Aldea, the teen girl second from the right, would marry Felix’s brother Moise “Moses” Baillargeon three years later in 1907. After Moses died in 1937, Aldea married Felix’s and Moses’s brother Leon Baillargeon in 1943! So the Olivier girls really liked the Baillargeon boys, apparently. Aldea and both of her husbands are buried together and on the same tombstone. 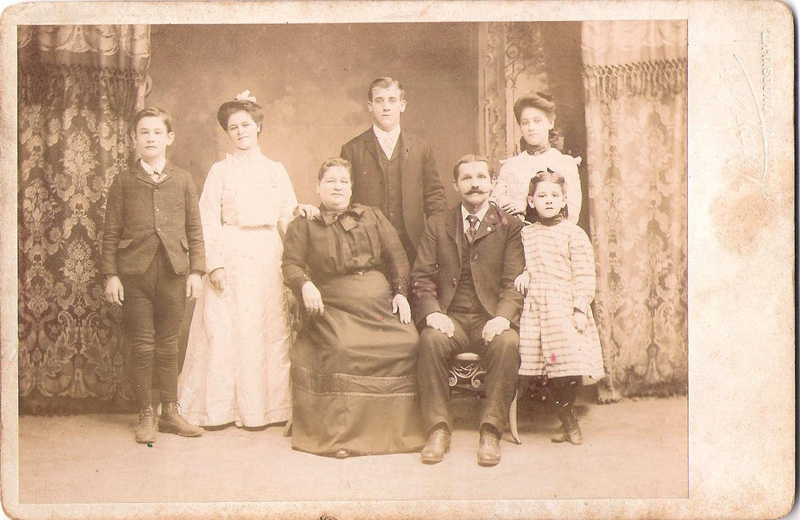 Hildaige, the father in the wedding photo, was the first cousin of my great-grandmother Delia Bacon. The man who sent it to me says there are more from the Olivier family. I’m in negotiations to have them sent to me. By the way, the couple in the photo… Felix and Jenny.. they had 14 kids. I’m sure there are dozens of living relatives who will be very interested in this photo! Just a short note about something I discovered recently while researching the family of my 5x great-grandfather Gordon Folsom (1878-1813). The first child of Gordon and his wife Nancy Taylor (apparently a British immigrant) was their daughter Mary W. “Polly” Folsom (1806-1883). 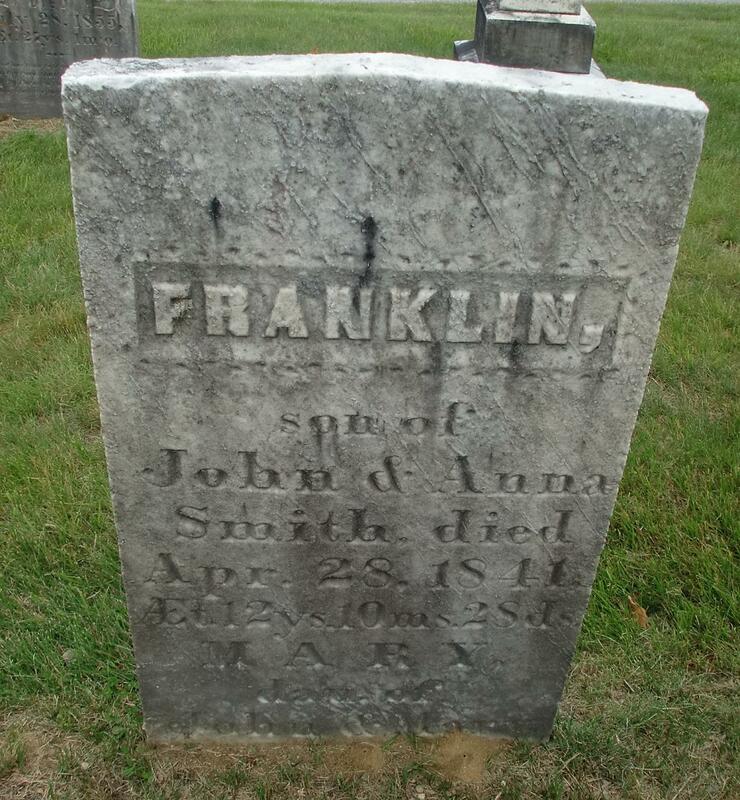 She married John Smith (1801-1883), a farmer from Cumberland, Maine who had been married previously. John and Polly had two daughters. The first was Mary Elizabeth Wood Smith (1832-1841), who died at only 8 years old at the same time as her half-brother Franklin Smith. Their names are together on a shared tombstone in the Pine Street Cemetery in Auburn, Maine. The second daughter was Helen Maria Smith. Helen was born 11 May 1834 in Danville, Maine. 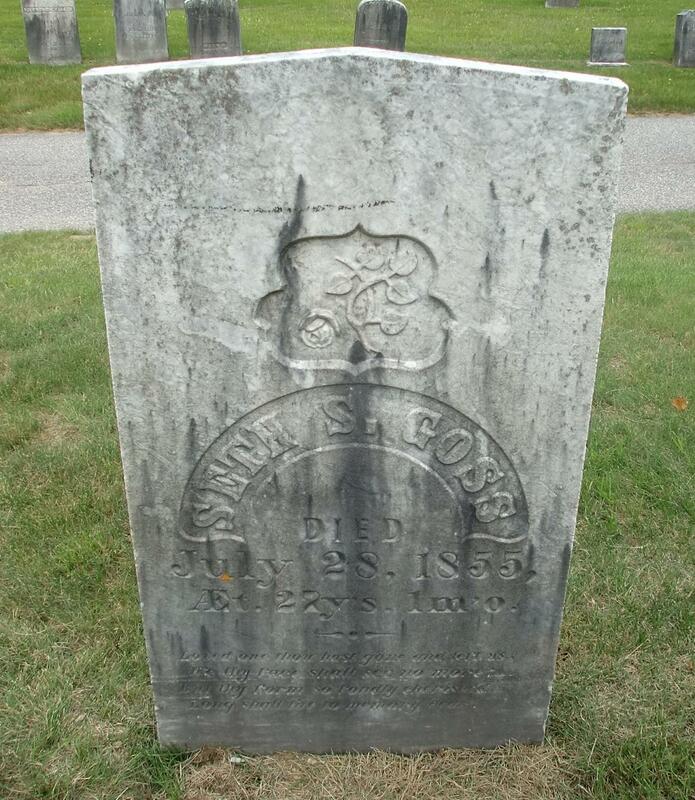 She married Seth S. Goss, a farmer from her home town, in Boston on 14 Jan 1854 when she was 19 and he was 25. It’s not hard to imagine them as childhood sweethearts, growing up together in Danville. Then tragedy struck. 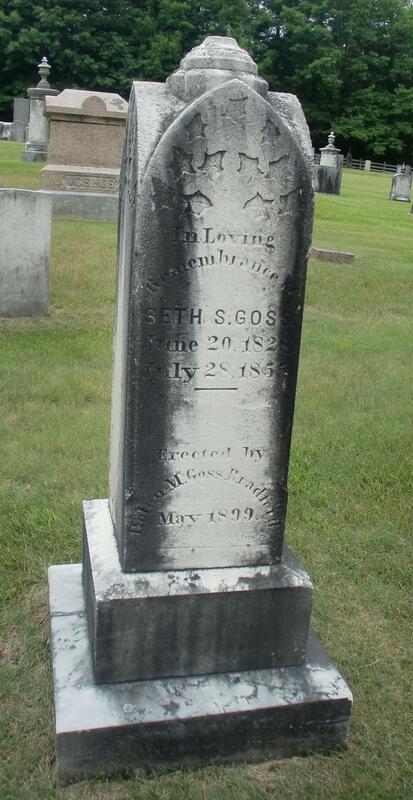 Only a year and a half after their marriage, Seth died suddenly on 28 Jul 1855 at the age of 27. He was also buried in the Pine Street Cemetery, next to his sister-in-law whose tombstone we saw earlier. Having lost her husband, Helen remarried to Josephus Bradford, a farmer who had immigrated from New Brunswick, Canada, to Calais, Maine with his family when he was just a young boy. 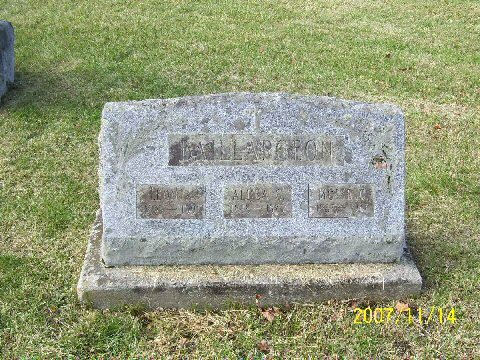 The couple moved to South Berwick, Maine and had two boys: Clarence G. Bradford who was born on 17 Aug 1858, and Edgar E. Bradford who was born two years later on 4 Mar 1860. (Their birth years are reversed on FindAGrave.com, but all other documents list them as stated here.) Helen and Josephus also had another child who apparently died in infancy. The family is in the 186o, 1870, and 1880 census records for South Berwick, where Josephus is listed as a Farmer. Helen saw a series of heartbreaks in her life: Her youngest son Edgar died on 23 Jul 1884 at the age of 24, her husband Josephus died on 31 Jan 1898 from a heart infection, and her other son Clarence died months later on 3 Sept 1898 from heart disease. All of them were buried in the Portland Street Cemetery in South Berwick, Maine. Helen is listed alone as a widowed farmer in the 1900 census for South Berwick. In the 1910 census she is living on Main Street, listed as a widow, and under occupation it says “own income”. I’m guessing she sold the farm and retied on the income from the sale. Obelisk at Seth Goss’s grave. So 44 years later, her first flame still held that much of a special place in her heart. Helen Maria Smith Goss Bradford died 20 Sept 1913 and was buried with her husband and sons in South Berwick, Maine. I came across this photo in the archives of my grand-aunt Shirley Paulus Krueger. It seemed something of broader historical significance, so I’m posting it here. 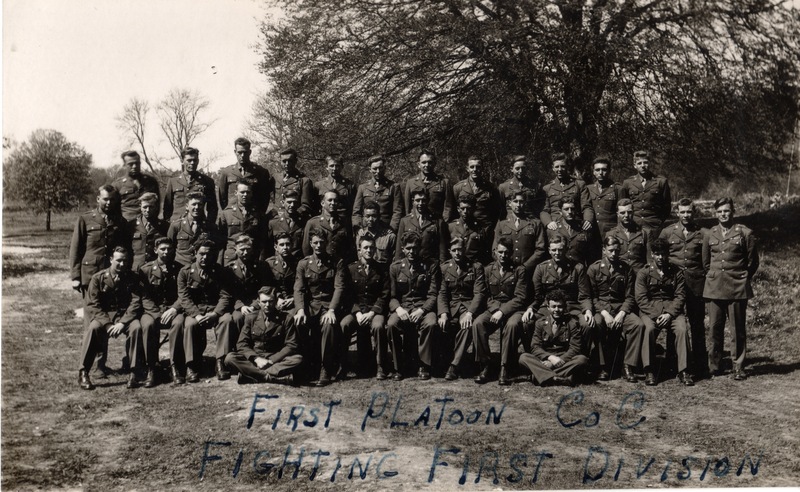 The front says “First Platoon, Co. C, Fighting First Division”. The back says: “May 5, ’44 – England. Some of the gang. To: Shirley (Paulus) from Lawrence”. I don’t know if Lawrence was a friend, or family member. Since I’m currently looking for some platoon photos online, I thought the timing was good to put this out there. Hopefully it will be helpful to someone looking for their own relatives. I had previously written two blogs laying out the confusing “Mystery of Joel W. Celley and Hattie S. Thomas”. The short version is that there was a Joel W. Celley, a hotel owner and tree nursery operator who was married to Florilla “Flora” Rich and living in Colchester, Vermont, and another Joel W. Cilley, a lumberman who was having children between 1861 and 1880 with my relative Harriet S. Thomas in nearby Burlington, Vermont. Either there were two Joel W. Cilley’s who were about the same age living a couple of miles away from each other, or Joel W. Cilley was living some kind of double-life with wives in two towns. My 4th great-grandfather James Thomas (abt 1782 – abt 1863) had several children, among them my 3rd great-grandfather Charles H.L. Thomas (1821 – 1873). One of his other sons was Beriah Ransom Thomas (1816 – 1908) about whom we happen to know quite a bit because he had at least four lengthy obituaries published when he died. He was a butcher, railroad worker, and policeman who lived in Burlington, Vermont for the last 60+ years of his life and died “one of the oldest men in the county” at over 92 years old. His obituary mentions “he is survived by a daughter, Mrs. Harriet S. Celley of South Royalton”. Harriet was born in Chazy, N.Y. in July of 1845, according to the 1900 census. In 1850 she’s listed in the census for Burlington, Vermont with her mother and father and a brother and sister. In the 1860 census she’s still in Burlington, still living with her parents and two of her brothers this time. Joseph W. “Joel” Cilley was born in Walden, Vermont about 1835, and grew up in the town of Burke, New York (where my branch of the Thomas family was living at the same time) . He can be seen in the 1850 census for Burke with his parents Francis “Franklin” Cilley (1793-1859) and Judith “Ruth” Scribner (1794-1852) Since Joel’s father was a farmer in Burke in 1850 and my great-great-great-grandfather Charles Thomas was a blacksmith in Burke in 1850, I find myself thinking that they probably did business with each other when Francis Cilley’s horses needed re-shoeing, or his wagons needed repair. 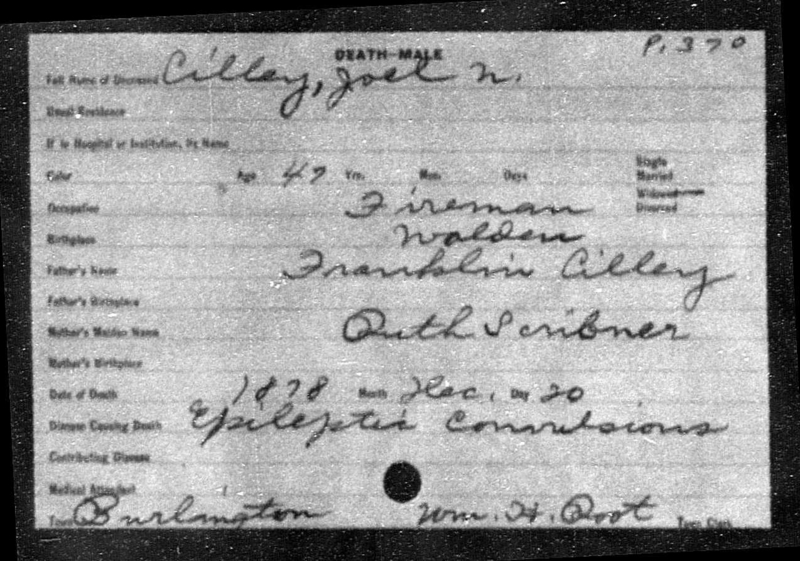 Harriet Maria “Nettie” Cilley, born 12 Dec 1861 in Burlington, VT to “Joel W. and Harriet S. Cilley”, according to her death record. This means that Harriet Thomas was 7 and a half months pregnant when she and Joel got married. Elma Cilley, born 14 May 1870 in Burlington, VT to “Harriet Thomas and Joel Cilly”, who is listed as a “lumberman”. 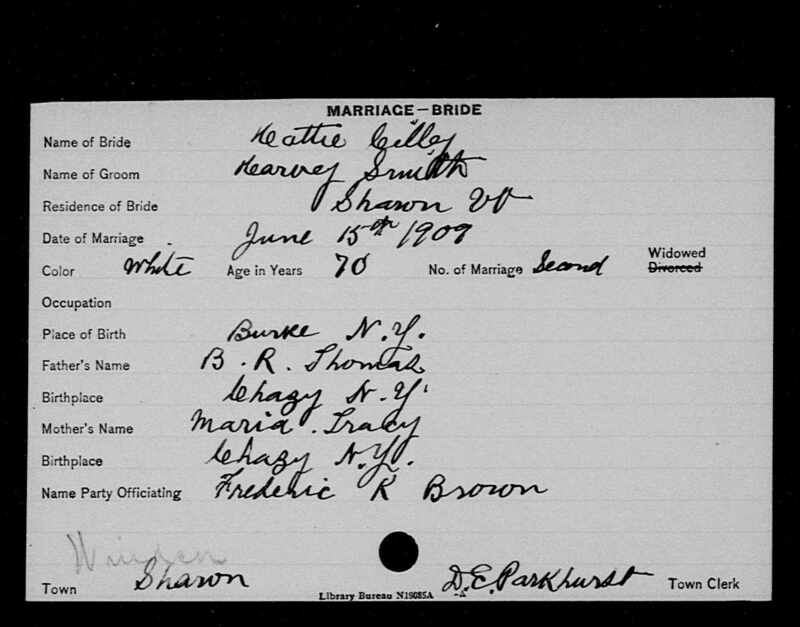 Marriage record for Alice Elizabeth Cilley, born about 1870, daughter of Joel Cilley and “Harris Thomas”. She gets married in Colchester, Vermont in 1890. Edna Cilley, born 16 Nov 1872 in Burlington, VT to “Harriet Thomas and Joel Cilley” who is listed as being from Walden, Vermont and is a “lumber boss”. Franklin E. Cilley, born 26 Aug 1875 in Burlington, VT to “Harriet Thomas and Joel W. Scilley” who is listed as a “laborer”. 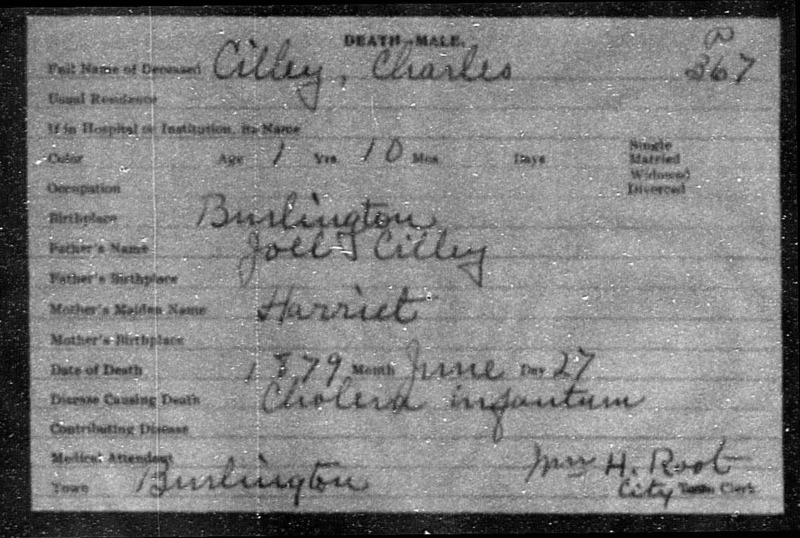 Charles L. Cilley, born 4 Sept 1877 in Burlington, VT to “Harriet Thomas” and “Joseph W. Cilley” who is listed as a “laborer”. Marriage record for Sarah E. Celley born about 1885, daughter of “Joe. W. Cilley and Harriet S. Thomas”. She gets married in Royalton, Vermont in 1902. Searching for information on their children, I found an 1880 census record for Burlington, Vermont. Three of the Cilley children had been left at the “Home for Destitute Children”. I was shocked and sad. I’ve since noticed that they are all “attending school”, so at least they were getting an education there. And it seems like there was a reasonable staff to take care of the children. I later found that a “Mary Cilley” had died at the Home for Destitute Children and was buried in a grave for the Home. You can see the record on FindAGrave.com. That makes 9 of 11 children that we know about. So at least four of the Cilley children were in an orphanage. Where were the parents? I found “Harriet S. Celley” working as a “nurse” for a 65-year-old widow named Julia Morse in the same 1880 census for Burlington, VT. No kids with her. Julia is listed as having diphtheria. Harriet is listed as “widowed”. Perhaps she sent the children away so they would not be exposed to the disease? Was their father really dead? He is listed as a “fireman”, which usually meant someone who stoked the fires for a steam-engine of some kind. Perhaps to operate machinery in the lumber yard? 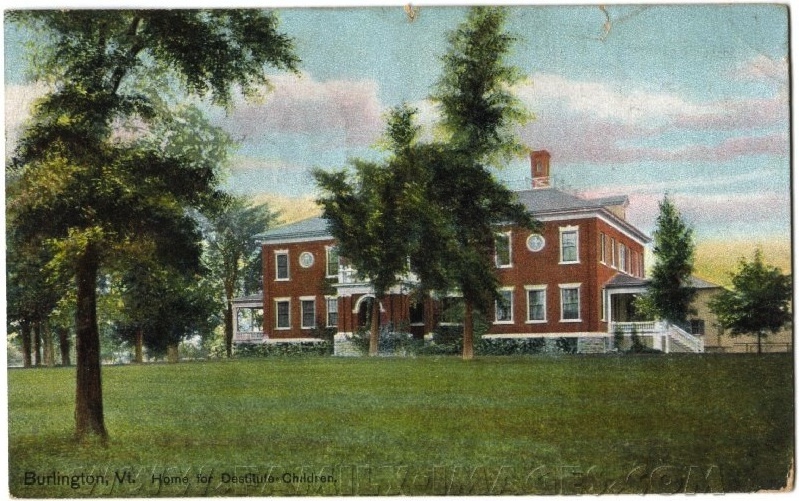 His birth place was Walden, Vermont which matches the birth record for Edna Cilley. 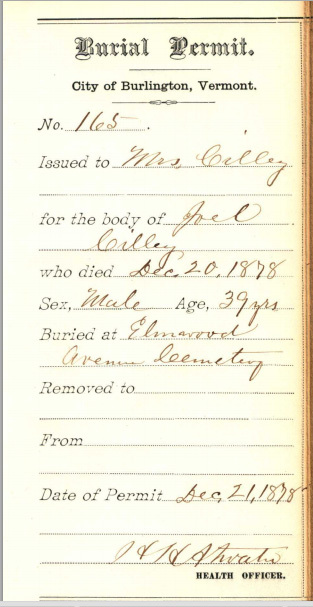 Joel was buried in Elmwood Cemetery in Burlington according to records sent by the Elmwood Cemetery office. So things start to make much more sense now. According to the Burlington City Directory records for the years from 1865-1878 (which I located subsequently) Joel and Harriet had been living together near the docks of Lake Champlain where Joel worked in the extensive lumberyards which used to line the shore [lumber was shipped to Burlington from Quebec, Canada]. Joel worked for Hunterstown Lumber, which then became the Rolfe Tyler & Co. lumber yards while he was still working there. He also worked for the Shepard & Morse (later Shepard & Davis) lumber companies. This matches the “Lumberman” and “Lumber boss” descriptions from his children’s birth records. Shepard & Morse lumber ships, c1900. Then in 1878, Harriet’s husband has a seizure and dies. Six months later, their son Charles dies of Typhoid. According to the 1900 census Harriet and Joel had 11 children. I don’t know how many were still alive in 1879 [in the same 1900 census Harriet says only 3 of her children were still alive at that point, so presumably some of them died in childhood], but I can imagine after losing her husband and son, Harriet probably didn’t feel equipped to take care of her kids. So she found a reasonably good home for them. In 1880 she is listed as working as a nurse for a woman with Diphtheria. The census page where Harriet is listed is marked as “Saint Paul”. This could just mean the neighborhood near St. Paul’s Cathedral. St. Paul’s is very near Cherry, Pearl, and Battery Streets, which are all places the Cilley family lived between 1865 and 1878. Perhaps she felt that taking care of Julia Morse was one way she could do something good with her life after all the tragedy she had endured. Their daughter “Nettie” Cilley had gone to live first with her uncle Beriah Wolcott Thomas (in 1870), then with Harriet’s father Beriah Ransom Thomas (in the 1880 census for Burlington where she’s listed as a “seamstress”). Edgar, Franklin, and Elma were put in the Home for Destitute Children. Their sister Mary Cilley apparently died there, probably in 1879 or early 1880 since she’s not in the census. So far I don’t know what happened to Edna (b 1872). She wasn’t in the home with her siblings. There is a Burlington City Directory from 1896 listing for an “Edna G. Celley” living with “Hattie M. Celley”, but this Edna was the daughter of Hattie Hurlbert and Herbert Celley, and was born in 1878, not 1872. It’s likely Edna Cilley was one of the children who died in infancy. There is an Edgar Cilley in the 1904 city directory for St. Albans, Vermont, but records seem to indicate he was born in Lowell, Massachusetts. There are still two children who are totally unknown… if Harriet did, in fact, have 11 children. It’s not known if any of Harriet’s children might have been adopted or survived without her knowledge. By 1910 she had moved to Providence, Rhode Island where she was working as a “Ward Maid” in the St. Mary’s Orphanage. I like the symmetry of her working at an orphanage, helping children, when at least four of her siblings had been in a similar institution. In 1920 she’s listed as “Harriet M. Thomas” and working for the Rhode Island Hospital. She died of a kidney condition on 17 Apr 1922 in the same hospital where she worked. Alice Elizabeth Cilley (b 1870) married Edward Bailey in 1890, an unknown man named Wood about 1900 with whom she had a daughter, Edna M. Wood (b 1902), and married a third time in 1906 to Abraham Turner. She died in New Bedford, Massachusetts sometime between 1931 and 1940 (her husband is a widower in the 1940 census). Sarah E. “Sadie” Cilley (1885-1978) lived with her mother in South Royalton, Vermont. She married George W. Snow there in 1902 the day before her 17th birthday. They had a boy named Donald Pearl Snow (1905-1962). In 1910 she’s listed living in some kind of hotel on West Park Street in Lebanon, New Hampshire and working as a weaver in a wool mill. She’s listed as married, but her husband is not with her. Sadie filed for divorce in October of 1912 for reasons of “abandonment”, which explains why her husband wasn’t with her. She then married Patrick Bernard LaCoe (1874-1963) in 1914, and is living with him in the 1920 (Windsor, VT), 1930 (White River Junction, VT), and 1940 (same) Census records. She died in Hanover, New Hampshire in Nov 1978 at the age of 92. Sarah’s son Donald Pearl Snow married Eva Marion Rowe (1908-1987) and they had two sons, George Donald and Gary Snow. George had at least four children who are living as of this writing. If you were paying close attention, you may have noticed that Sarah Cilley was born seven years after her father died. It’s yet another mysterious wrinkle in this story. My first thought was that she was born earlier than 1885, but in the 1900 census she’s listed as 15 years old, and women don’t usually start fibbing about their age that young. She also lived until 1978, so if she were born any earlier, she’d have been quite old indeed! Sarah and her family seem to have thought Joel was her father. Her 1902 marriage record to George W. Snow lists her parents as “Joe. W. Cilley and Harriet S. Thomas”. The real identity of her father is unknown. I have tracked down living descendants of Sarah and George Snow, but so far I haven’t gotten in touch with them. Hopefully someone in the family knows something about their family history. The 1900 census for Sharon, Vermont, as indicated above, shows Harriet Thomas Cilley working as the housekeeper for her future husband Harvey Smith. She’s living with her youngest daughter Sarah, who is 15. She’s again listed as “Widowed”. 1910 Census entry, Sharon, Windsor, Vermont. Shortly after this Harriet was living in South Royalton, Vermont (4 miles away from Sharon, VT) according to her father Beriah’s obituary from 1908. On 15 Jun 1909 she remarried at 63 years of age. 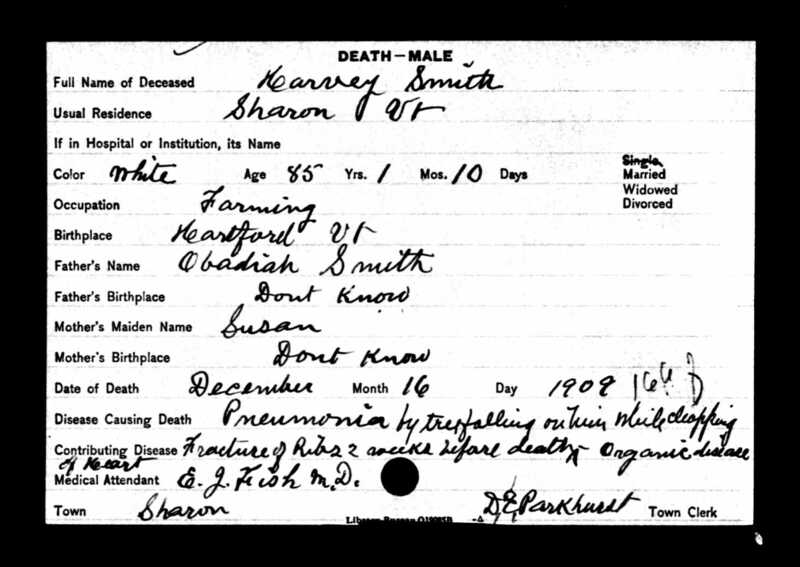 Her husband was Harvey C Smith, the farmer she was working for as a housekeeper in 1900. He is 83, and it was his second marriage also, his first being some 64 years earlier to Sybil C. Whitney in 1846. 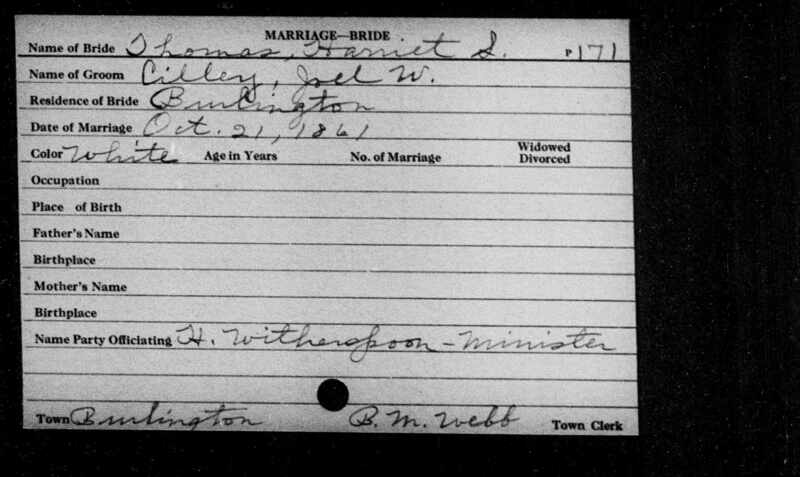 Smith/Thomas Marriage 1909 in Sharon, WIndsor, Vermont. But just 10 months later in April of 1910, she’s living alone as a widow again in Royalton, Windsor, Vermont. I’m thinking she married old Harvey just before he died so that she’d have some income when he went, or he agreed to marry her to make sure she was provided for after his death. But poor old Harvey died only six months after their marriage when a tree fell on him while he was chopping wood, breaking his ribs and giving him pneumonia. He was 85 years old. 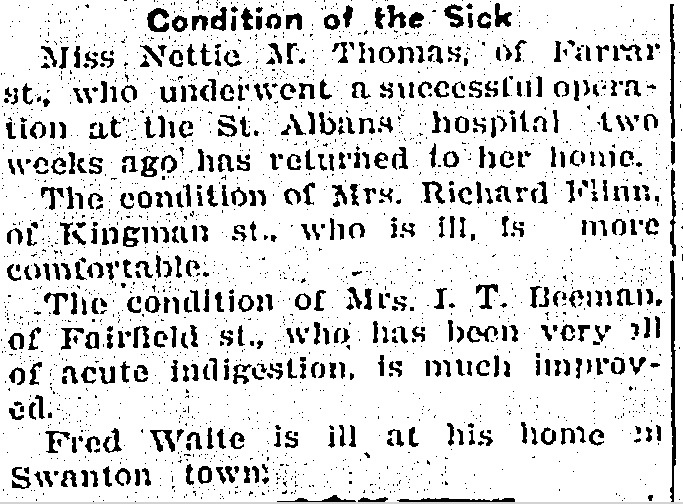 The small article below, found in the “Saint Albans Messenger” from September 4, 1914, let me know that Harriet died in Quechee, Windsor, Vermont on August 31, 1914. I haven’t found a death record or grave for her yet.